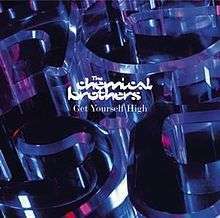 "Get Yourself High" is a 2003 single by The Chemical Brothers. It features Canadian rapper k-os and appeared as a bonus track on their collection Singles 93–03. A music video directed by Joseph Kahn, featuring a digitally enhanced version of an old martial arts film called 2 Champions of Shaolin accompanied this song. The song was nominated for a Grammy for Best Dance Recording, but lost to "Toxic" by Britney Spears. Writing for Stylus Magazine, Andrew Unterberger said the song is "resoundingly meh" with "a thoroughly OK production with some grating vocals" from k-os, and then favors another new track from Singles 93-03, "The Golden Path." In complete contrast, David Medsker from PopMatters prefer the song over "The Golden Path", called it their "first real hip-hop track" that "demands its listeners to drop and do the worm." He also stated: "[...] There’s something about the key, a combination of a major note and its sharp, that sticks in the craw. This will sound very cool in the clubs." musicOMH's Jamie Harper said the song "goes into new territory, as [the duo] invite Canadian rapper K-OS to MC over their creation." A new version of the song appeared on their live album Don't Think received a positive feedback from Nate Patrin of Pitchfork Media, he stated: "It all flows so smoothly so immediately that tracks which felt like late-career missteps on album-- like overstuffed pigeon-toed funk oddities like "Do It Again" and "Get Yourself High", which show up in succession in the set's first 10 minutes—come across as all-hook monsters, fused in a way that splits the difference and shaves off all the fat." The duo performing the song at Summercase 2007. A music video directed by Joseph Kahn, featuring a digitally enhanced version of an old martial arts film called 2 Champions of Shaolin accompanied this song. I edited this on a laptop on a plane to Chicago. I rearranged the time sequencing of the actual movie. The bad guy with the big boombox is actually a minor henchman who dies in the first 30 minutes, but in my visual remix he’s the ultimate antagonist. The lip syncing was motion captured, then applied to 3D models of jaws. I didn’t know 100% if the technology was achievable with the time and money, nor did I know if we could actually get rights to a Chinese kung fu flick. It was a risky venture, but Carole gave me a check and then left me alone. She had some major balls. Ashley Ringrose from Smashing Magazine listed the video at number 32 for his list of "60 Beautiful Music Videos." "Get Yourself High (Album Version)"
"Get Yourself High (Felix Da Housecat's Chemical Meltdown Mix)"
"Get Yourself High (Switches Rely On Dub)"
"Get Yourself High (Extended Version)"
"Get Yourself High (Switches Rely On Rub)"
"The Golden Path (Ewan Pearson Extended Vocal)"
"The Golden Path (Ewan's Rave Hell Dub)"
↑ Hard Boiled (Commentary with Bey Logan). John Woo. Dragon Dynasty. 2007 . ↑ "Joseph Khan official website". ↑ Unterberger, Andrew (10 October 2003). "[Singles 93–03 review]". Stylus Magazine. Retrieved 12 March 2016. ↑ Medsker, David (30 September 2003). "[Singles 93–03 review]". PopMatters. Retrieved 12 March 2016. ↑ Harper, Jamie (22 September 2003). "[Singles 93–03 review]". musicOMH. Retrieved 12 March 2016. ↑ Patrin, Nate (27 March 2012). "[Don't Think review]". Pitchfork Media. Retrieved 12 March 2016. ↑ Ringrose, Ashley (16 November 2008). "60 Beautiful Music Videos". Smashing Magazine. Retrieved 12 March 2016. "Man I Used to Be"
"ELEctrik HeaT - the seekwiLL"
"I Wish I Knew Natalie Portman"